I have had my eye on this camera for a while. 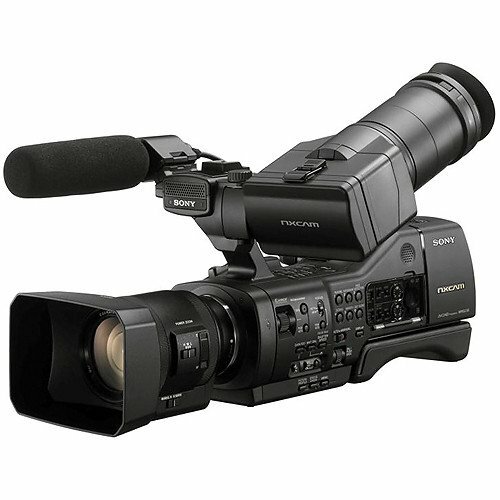 It is a large-sensor shoulder-mounted camcorder with interchangeable lenses, power zoom and built-in XLR inputs. It also takes pretty good 16.1 MP stills. This camera has the added bonus of a built-in shoulder mount - so there's no need to pay for an expensive rig to get the camera up on your shoulder. The NEX-EA50 is on sale for $2999 at Amazon, at Amazon via Adorama, and at Adorama Direct. If you want a large sensor, interchangeable lens, shoulder mounted still/video camera with pro mic inputs for less than $3000, the EA50 is pretty much the only game in town.